The Rundown: Sorry for the lack of new posts over the last couple of weeks folks! Work has been killer and I just haven't had much free time for posting. I'm actually doing this post at 5 in the morning (sorry if it's a bit incoherent), but I just had to get this one up right away! I just picked up these super keen retailer incentives for the big IDW crossover event "Infestation", and I really wanted to post this up fast so folks are aware of these. 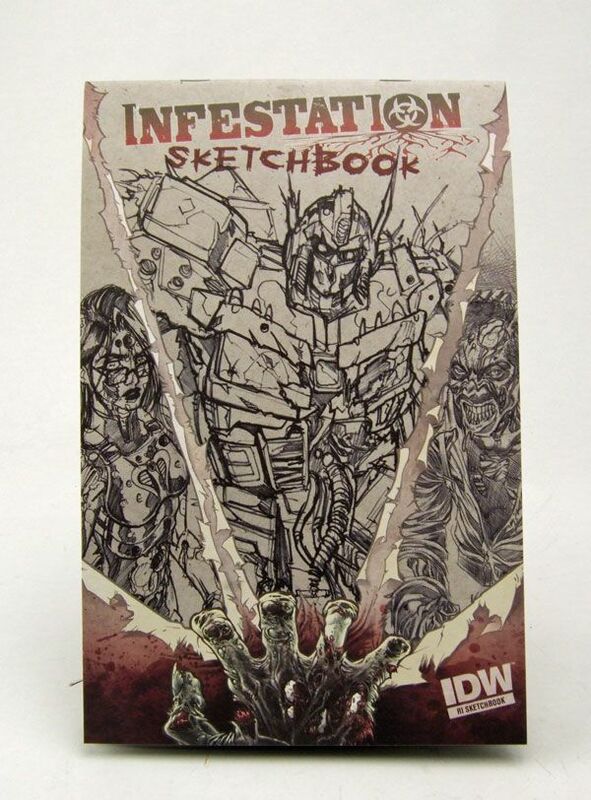 For those of you haven't been keeping current with the wonderful IDW comics (shame on you), "Infestation" is company wide crossover dealing with one of my all-time favorite group of vile villains: ZOMBIES! The story runs through 4 different properties licensed to IDW- G.I.Joe, Transformers, Ghostbusters, and (most importantly) Star Trek! While none of the properties cross paths with each other (you won't see Kirk riding shotgun in Bumblebee or anything like that), the zombie story runs across each universe and is bookended by 2 "Infestation" specials, the first of which hit comic shops yesterday. Along with the book, retailers who ordered enough copies received special incentives to sell (or give away...). 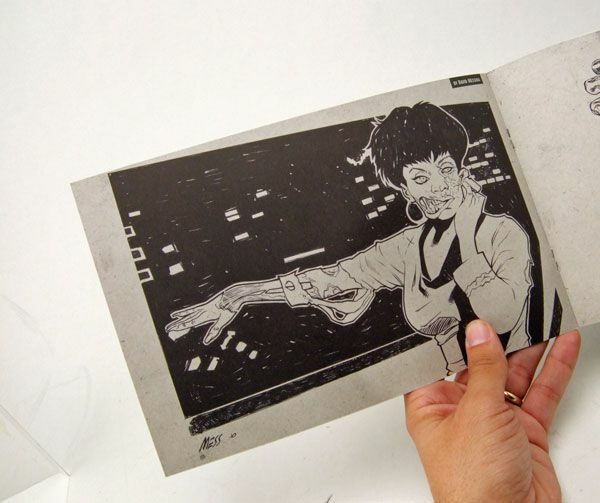 For every 10 copies ordered, stores got 1 copy of the sketchbook pictured above. ...and this awesome shot by David Messina of zombie Uhura at her station! Now I know a lot of folks might be saying "zombies and Star Trek? Ummm... no thanks! Keep Trek serious please". But really, what's the fun in that? I mean, Trek crossed over with hippies. so why not zombies? I personally LOVE zombie stories, and I don't see the harm in doing a Trek story with them, especially if it's handled right, which this one looks to be. It's being written by my buddy Scott Tipton (bonus), it's set in the TMP era (double bonus), and it has freaking zombies in it (TRIPLE bonus). What's not to love!?! The other incentive item for the book is this nifty patch. 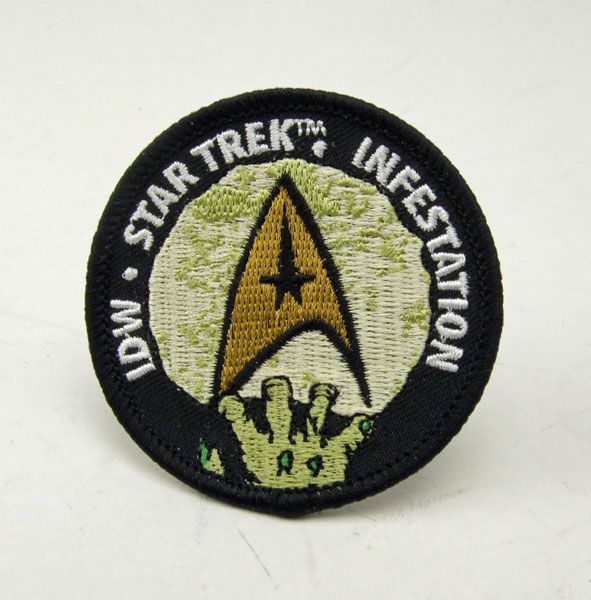 For every 5 copies ordered, IDW sent along a pack of 5 Trek "Infestation" patches. Each of the 4 licensed properties involved will have a patch featuring their logo with the zombie hand reaching up to it. Of course we all know that the Trek patch is the most important one, and I'm super stoked to iron this puppy onto my favorite jacket. If my wife lets me. Which she won't. So there ya go! If you're interested in learning more about the book (which you should), head over to your local comic shop and ask your friendly retailer to point you towards "Infestation" issue 1! While you're at, ask him if he has any of these incentives handy. If he doesn't, and you really want one, well e-mail your name to apieceoftheaction@live.com and there's a chance you might get a set for FREE! That's right! My local comic shop (Queen City comics in Fairfield, OH) was nice enough to hook me up with an extra patch and sketchbook to give away here at the blog! 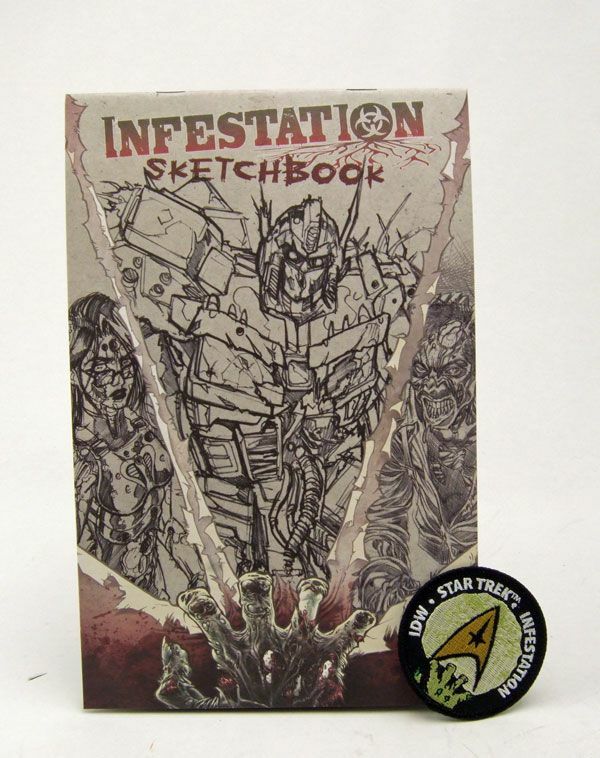 So shoot an e-mail to apieceoftheaction@live.com with your name and zip code (please put "Infestation" in the subject line too) and get entered to win! I'll pick one name at random in about a week or so! Good luck... and go check out the book! 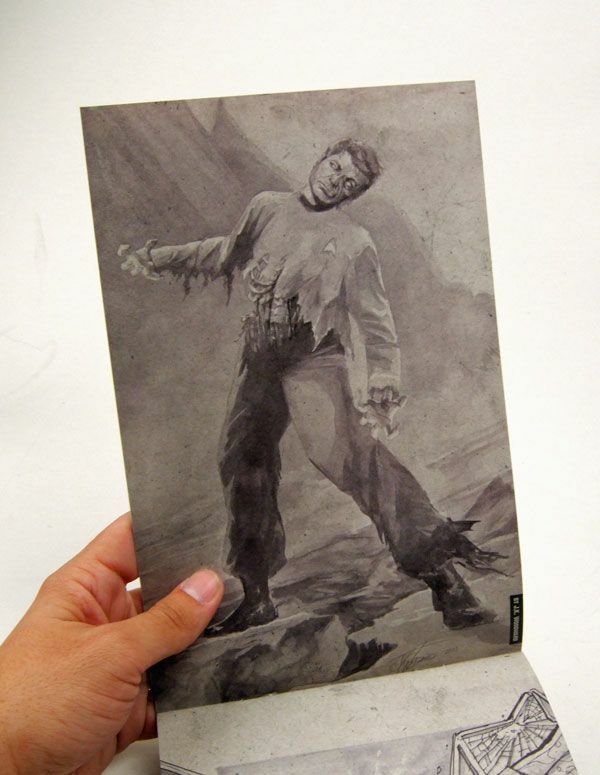 Zombies are a good reason to keep phasers on "disintegrate" at all times. Best way to deal with the undead, and no worries about making an accurate head shot! Did your local comic book shop happen to save a set for me? Thanks for keeping your readers up-to-date on the cool Trek stuff. You ought to write a "how-to photograph small stuff for a blog post" too. Nicely done. That drawing of McCoy is gorgeous. Now I want the issue just because of that. Unfortunately I live in a tiny town in Norway where Star Trek isn't the big thing. The comic book store had two Star Trek issues and a shelf filled with Star Wars. The only figures they have are Star Wars ones, I totally hate that store. I think I speak for the whole Star Trek-Collecting community when I say you're website has been an invaluable source of information and opinions about pretty much anything collectible. Now, I almost always check your website to see new reviews and get opinions on new figures. Keep up with the great work! Also, may "the great bird of the galaxy bless your planet" and "live long and prosper". I concur with Anonymous! Thank you for your thorough, entertaining and informative reviews. And thank you, too, for renewing my love for the old Playmate Trek figures. Your spotlights on these treasures have sent me back to my parent's garage and eBay hunting for those figures. Wow! Thanks for the very kind words guys!